MP probed in the case of abduction of Metropolitan Volodymyr's aide. 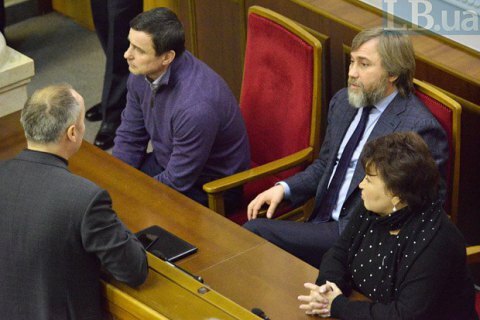 The Verkhovna Rada on 8 December gave go-ahead to the criminal prosecution of MP Vadym Novynskyy (Opposition Bloc). The motion was supported by 228 deputies at 226 minimum required. Of the 143 members of the faction PPB 103 deputies backed the PGO request. People's Front, numbering 81 deputies gave 55 votes. Self-Help – 25 of 26. Fatherland - 12 of 21. Radical Party - 15 of 21. Opposition Bloc, the Will of the People and Renaissance did not give any vote. Of the 46 non-allied deputies, 18 backed the motion. According to investigators, the former president Viktor Yanukovych wanted Metropolitan Volodymyr to be replaced by Metropolitan of Boryspil and Brovary Anhoniy (Pukanych). To step up pressure of Volodymyr, Yanukovych ordered to abduct Metropolitan's personal secretary Oleksandr Drabynko. The abduction was organized by the then Interior Minister Vitaliy Zakharchenko and the chief of Kyiv police Valeriy Koryak. They forced Drabynko to sign a request for protection. Members of the special police force, on Novynskyy's instructions, have for 170 days held Drabynko in a house outside Kyiv. The Prosecutor-General Yuriy Lutsenko has requested the parliament to lift Novynskyy's immunity from prosecution.